This article explains the Delta model by Dean Wilde and Arnoldo Hax in a practical way. After reading it, you understand the core of this strategy theory. What is the Delta model? Arnoldo Hax. Wilde is one of the founders of Dean & Company, and Hax is known from the MIT / Sloan School of Management. In the Delta model, the customer’s place is central in the middle of management. From there, the primary options to accomplish customer loyalty are investigated. It describes strategies to get and stay in touch with customers. As such, it helps managers to formulate and carry out an efficient corporate strategy that allows companies to profile themselves towards the rest of the world, and in doing so, attract customers. By looking at a) the best product, b) customer solutions, and c) system lock-in, a strategic position can be defined, lying the basis for profitability. Superior products respond to the customers’ needs and wishes and therefore form a solution to what they’re looking for. By coordinating these three strategic options with the business activities, an organisation is able to innovate, be more customer-oriented, and work more effectively. By being open to changes and implementing these in the company strategy and product development, customers will be more satisfied. Coordinating the most important company processes with the chosen strategy avoids an average result. 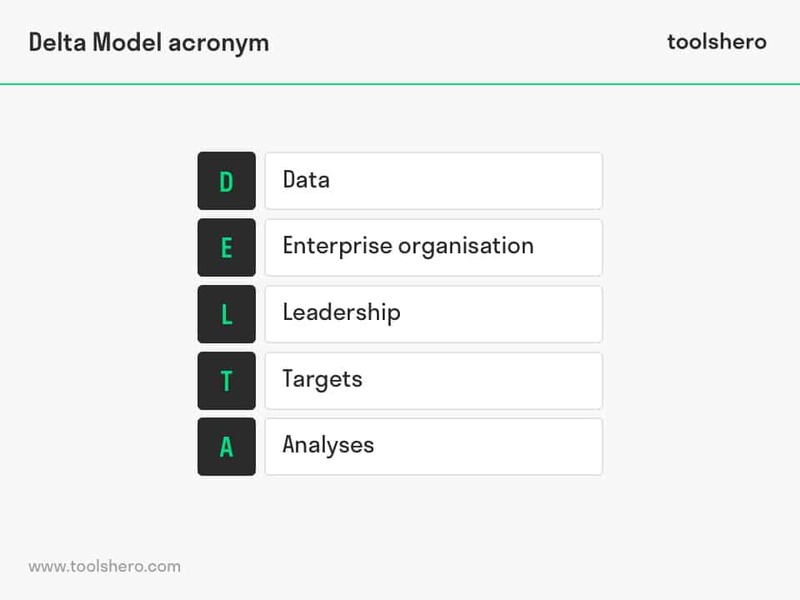 The Delta model identifies the core processes of an organisation, allowing it to constantly respond to changing situations and reach various strategic positions more easily. ‘Measure to manage’. Interim measurement and evaluation keeps the overview in focus and allows an organisation to adjust where necessary. Accessible and qualitative data in the form of information is a first requirement. The rise of the Internet and technologies regarding e-business and e-commerce allow for a new way to approach target audiences (and therefore customers). Information is essential for conducting analyses. Information provided and gathered by the company must also be complete and consistent to appear reliable. It’s important to have a company-wide approach. Irrespective of the size of an organisation, information must be accessible in all regions and hierarchical layers. Additionally, it must be possible to disseminate information quickly and in a way that transcends departments. This means that all employees and departments know what’s going on and what they must take into account in their contact with customers. Every organisation requires leadership, according to the Delta model. Each department must be led; that is the only way to allow for decision making based on facts. It’s the task of the leaders to aim for facts rather than simply make decisions based on intuition. Because the accountability lies with the leader, this allows for structured working, which benefits the service to the customers. Setting clear targets clarifies to everyone in the organisation what they should be working towards. It’s not all up in the air; a course has been plotted. The most potential value can be identified with a goal in mind. That will lead to success. Of course, sources such as time, money, and employees are just as important. Nevertheless, striving for a good result is impossible without an objective. By means of analyses, an organisation gains knowledge of what they do and whether objectives are achieved. For this purpose, analytical models must be built and maintained. Therefore, it’s necessary to determine beforehand which techniques, algorithms, and models will be used and which are most suitable to address a specific organisational problem. Subsequently, professionals start developing analytical software that can then be used. All five success factors are needed in the Delta model. When one factor is removed, that affects the remaining four factors and means the balance is lost. Without accessible information, for instance, it will be very difficult to implement this company wide and subsequently use it to make an objective analysis. The customer’s interest is paramount for Hax and Wilde. An organisation owes its existence to its customers. All business activities take place based on the customer. Therefore, the customer must be cherished. An organisation can distinguish itself by means of superior performance. This leads to satisfied customers who will subsequently return. This customer loyalty can only arise by gaining deep knowledge of the customer and building a close relationship with the customer. Do you recognize the practical explanation of the Delta model or do your have any additions? Do you use the Delta model within your organisation to formulate and implement company strategies to the advantage of customers? Or is there a different strategy method that you prefer?